'Skyray' (Richard Tasco R. 1995). Seedling# 91-65-04. SDB, Height 14" (36 cm), Midseason bloom. Standards and style arms light lavender blue; falls white, lined and stippled darker lavender blue; beards white, tangerine red in throat. 'Nimble Toes' X 'Hanky'. Superstition 1996. 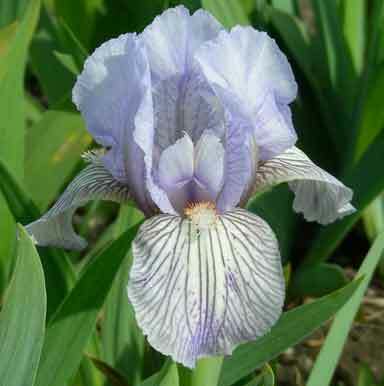 From AIS Bulletin #301 April 1996 Introducing SKYRAY (Tasco '96)--SDB, 14", M. Light lavender blue standards, white falls,stippled and heavily lined darker lavender blue; light lavender blue styles; white beards, tangerine red in throat. Sdlg # 91-65-04 (Nimble Toes X Hanky). $12.50. Superstition Iris Gardens. jpg 20170510_124820SDB Skyray (3).jpg manage 810 K 08 Aug 2017 - 13:21 HollyJohnson2017-04-01 Clump of SDB Skyray. Photo taken by Holly Johnson at the Minnesota Landscape Arboretum, zone 4b, on 5/10/2017. jpg 20170510_124919SDB Skyray (2).jpg manage 896 K 08 Aug 2017 - 13:20 HollyJohnson2017-04-01 Single bud of SDB Skyray. Photo taken by Holly Johnson at the Minnesota Landscape Arboretum, zone 4b, on 5/10/2017. jpg 20170510_33SDB Skyray.jpg manage 874 K 08 Aug 2017 - 13:20 HollyJohnson2017-04-01 Front view of SDB Skyray. Photo taken by Holly Johnson at the Minnesota Landscape Arboretum, zone 4b, on 5/10/2017. jpg BHP_5032-X2_skyray.jpg manage 165 K 11 Feb 2016 - 19:38 BrockHeilman Please contact Brock Heilman for image use.